The lsof command in Linux displays in its output information about files that are opened by processes. In this article, we will discuss the tool using 10 easy to understand examples. Please note that all examples mentioned in this tutorial have been tested on Ubuntu 16.04LTS. If you want to quickly see the name of files that have been opened by a particular process (or all processes), the lsof command lets you do that. An open file could be a regular file, directory, library, block special file, character special file, an executing text reference, or even a stream or a network file. The first column represents the process while the last column contains the file name. 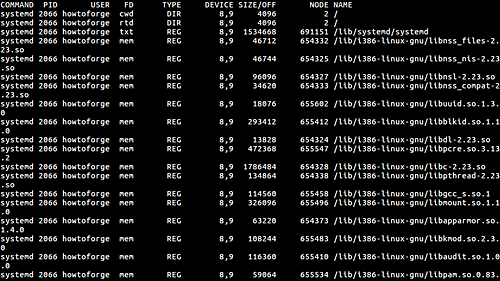 For details on all the columns, head to the command's man page. The tool also allows you to list files opened by processes belonging to a specific user. This feature can be accessed by using the -u command line option. 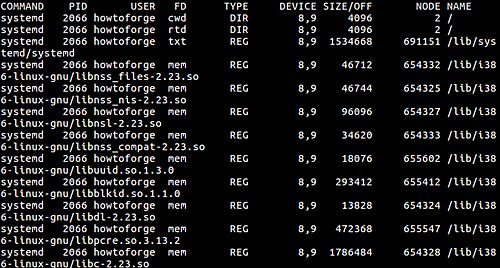 The tool also lets you display opened files based on process identification (PID) numbers. This can be done by using the -p command line option. As you can see in the above screenshot, the process with id 1 is excluded from the list. The tool allows you to list IDs of processes that have opened a particular file. This can be done by using the -t command line option. If you want, you can also make lsof search for all open instances of a directory (including all the files and directories it contains). This feature can be accessed using the +D command line option. This is possible by using the -i command line option we described earlier. Just that you have to use it without any arguments. Similarly, you can make lsof display TCP-specific files. 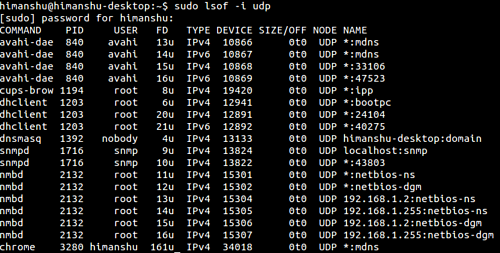 There's also an option that forces lsof to list the Parent Process IDentification (PPID) number in the output. The option in question is -R.
Although lsof offers a plethora of options, the ones we've discussed here should be enough to get you started. Once you're done practicing with these, head to the tool's man page to learn more about it. Oh, and in case you have any doubts and queries, drop in a comment below.